I have hesitated to post these photos for some time. Every time I look at them in my archive, I lean my head to one side, hold it there a minute, then pass by. These were the first photos I took in Voronezh when I was in that very cool city about a year ago. 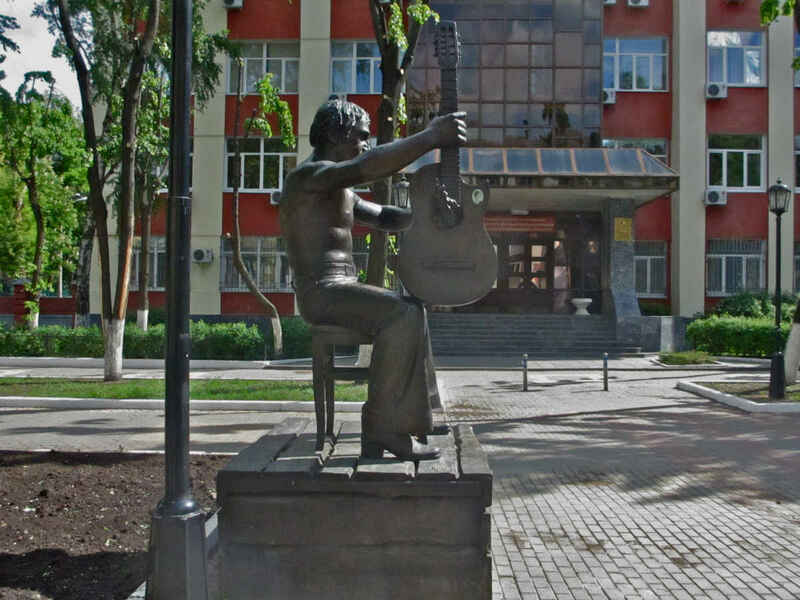 The monument to beloved actor and singer-songwriter Vladimir Vysotsky (1938-1980) is located just a stone’s throw from the Voronezh Chamber Theater where my wife Oksana and I were staying on a short working visit. 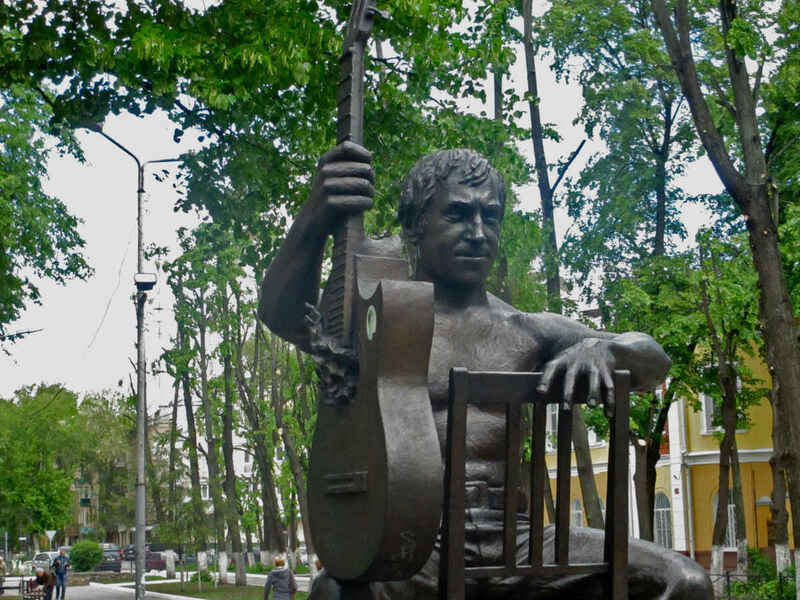 We went out to have breakfast at one of the few cafes open early Sunday morning and happened upon Vysotsky. I shot him on an empty stomach, could that be part of the problem? 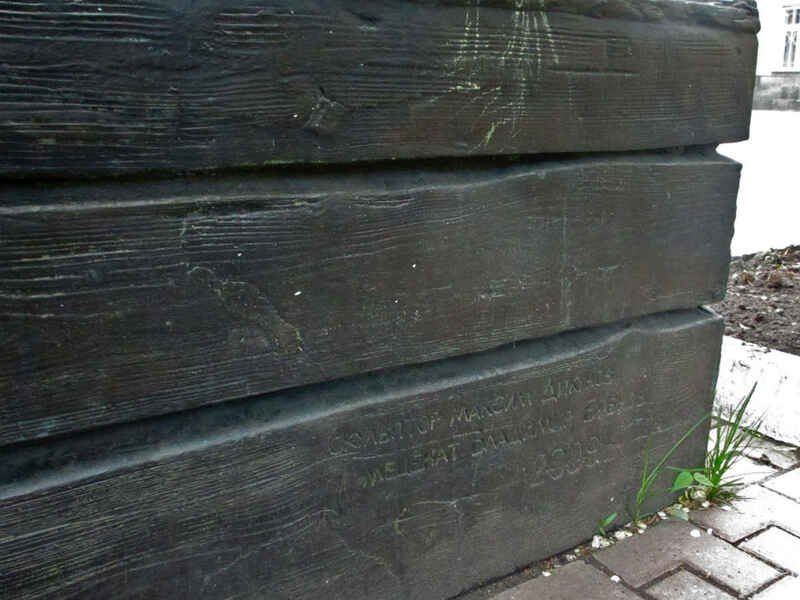 In fact, I am hardly the first person to have questions about this statue created by Maxim Dikunov and unveiled Sept. 9, 2009 in front of the Physical Education Institute at 59 Karl Marx Street. 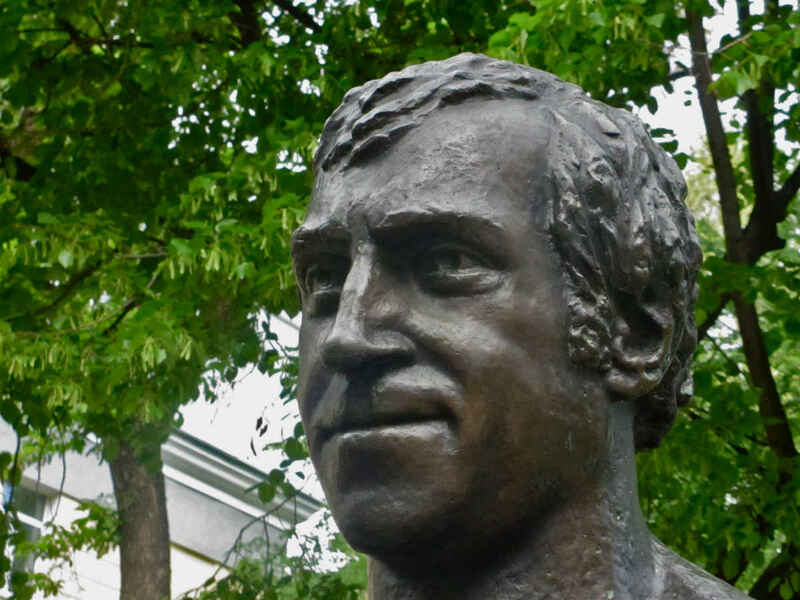 Everywhere you run into snide comments that Vysotsky, who died of drink and did anything but lead a so-called “healthy life,” does not belong in front of this institution. 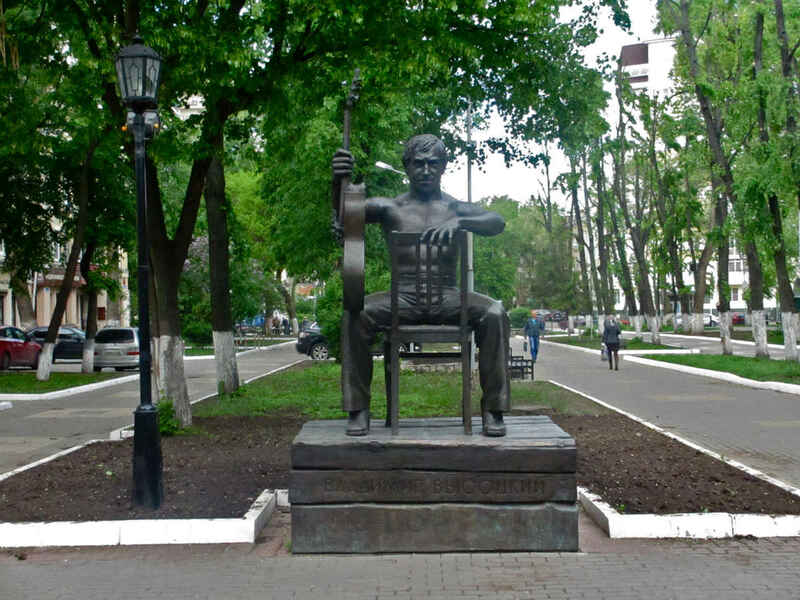 There are more complaints that Vysotsky, apparently, was never in Voronezh. None of this bothers me in the least. I am, however, of two minds about the sculpture itself. My first reaction was that it was kitsch, although an interesting bit of kitsch. 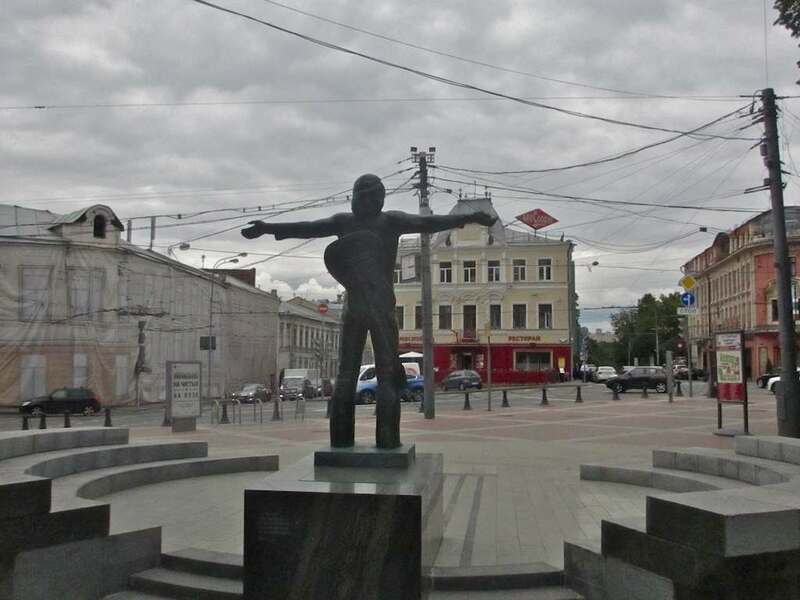 It’s not down on the rather gross level with the Vysotsky-Marina Vlady statue in Yekaterinburg. 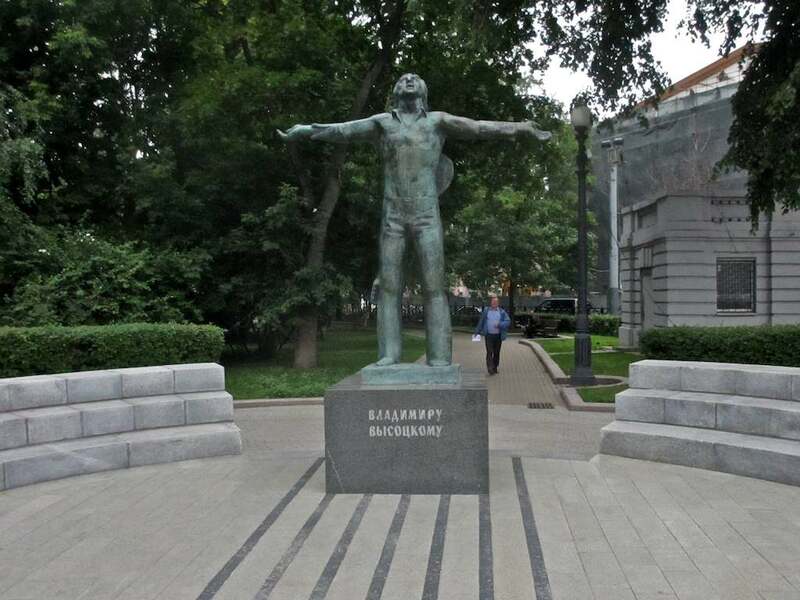 And if you think about the Moscow statue that stands at the corner of Strastnoi Boulevard and Petrovka, you begin to realize that there seems to be a problem in Russia with depicting one of its most popular heroes of the last half-century. I don’t like the slickness of this likeness in Voronezh. It’s too shiny and buffed and glossy. 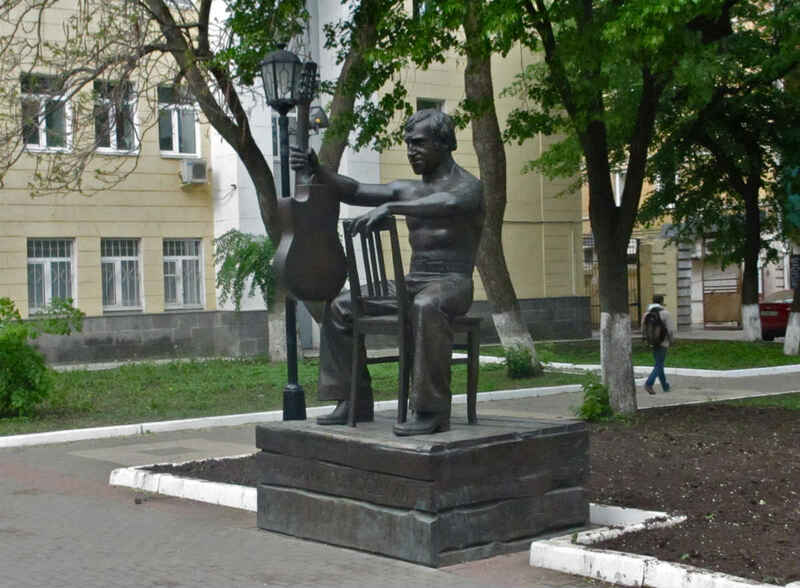 It’s almost as if the sculptor never really bothered to listen to Vysotsky’s voice, or watch clips of him move on stage at the Taganka Theater. I’m confused about the facial expression. I can’t quite decide if he’s suffering from hemorrhoids or if he’s just hiding some secret from us. The turned-around chair shouldn’t be a problem (in art you can do whatever you can get away with), but in the context – the gloss, the grin, the weird left hand, the guitar wielded more as Peter Townshend might than Vysotsky (for whom the guitar most of the time was just a prop on which he plunked out of tune) – this whole ensemble has an uncomfortable look. As I walked around, and as I look at the pictures I brought home with me, I find myself wriggling my shoulders and hips and elbows trying to shake out a sensation of awkwardness. But there is a test that all sculptures and monuments have to pass (or not): the test of “do you want to go back and look?” And, I must say, during my three days in Voronezh, I came back here several times. I even photographed it a second time, wondering if I might find some new angles (I didn’t). And as I walked past it each time, I sensed the human quality of the statue. I might bicker with it as an image, but its ability to reach me on a personal, human level was undeniable. I get that same feeling when I look at the photos here, no matter how much I want to gripe about them. Meanwhile, the sculpture is passing a pretty interesting test over at Trip Advisor. Random people go on there and comment on the monument. As of this writing, twenty-one people have expressed their opinion. And wouldn’t you know – most are in favor of it. Maybe there’s some supportive trolling going on, but I can’t know that. 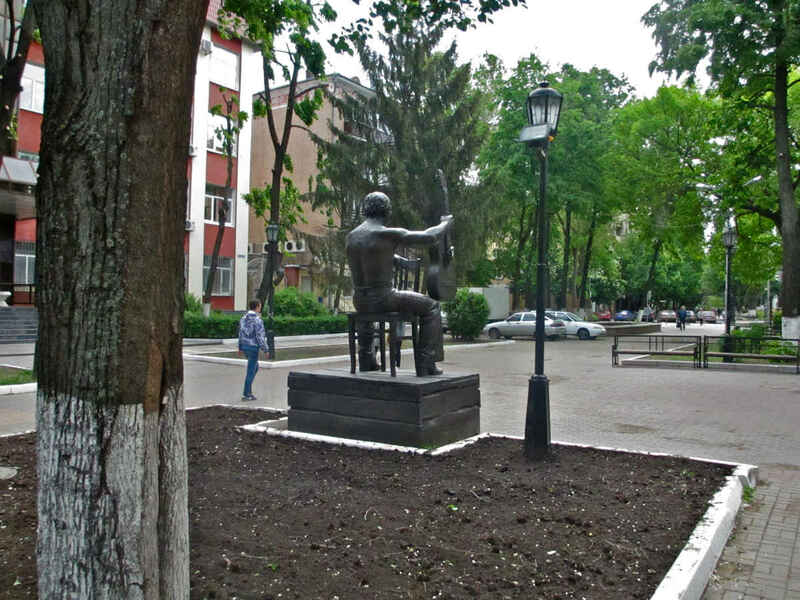 I just see things like, “a very worthy piece of work”; “The reaction of locals was complex – after all Vysotsky was never in Voronezh – but the sculpture is interesting”; “I’ve seen monuments to Vysotsky in Rostov, Volzhsky and Sochi, but I thought the one in Voronezh was the best”; “Excellent work by the sculptor!” and so on. As for the topic of whether Vysotsky was ever in Voronezh, there are rumors that he hung out at someone’s private party there in the 1960s. 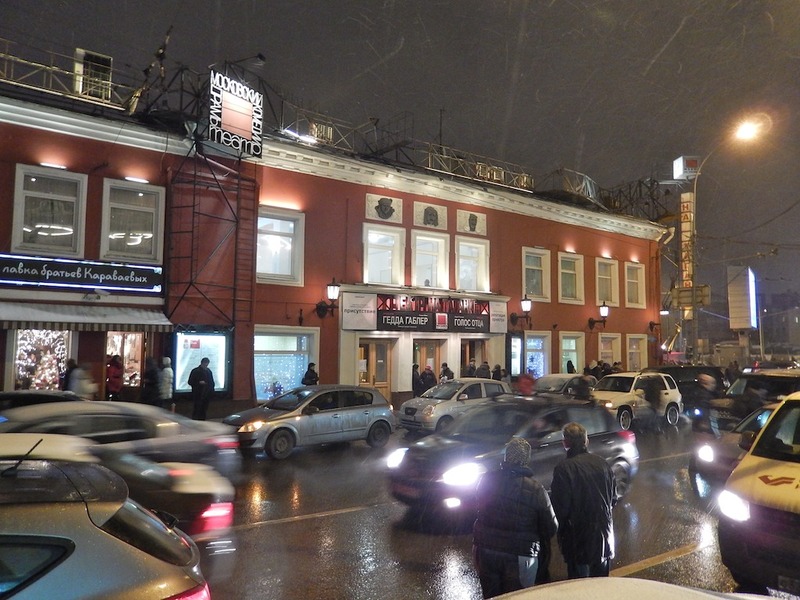 There is also talk that he once gave a closed concert for approximately 100 spectators at the city’s Green Theater near Dynamo Park. In any case, that is what one website tells us as it tries to find five things that attach the memory of Vysotsky to Voronezh. 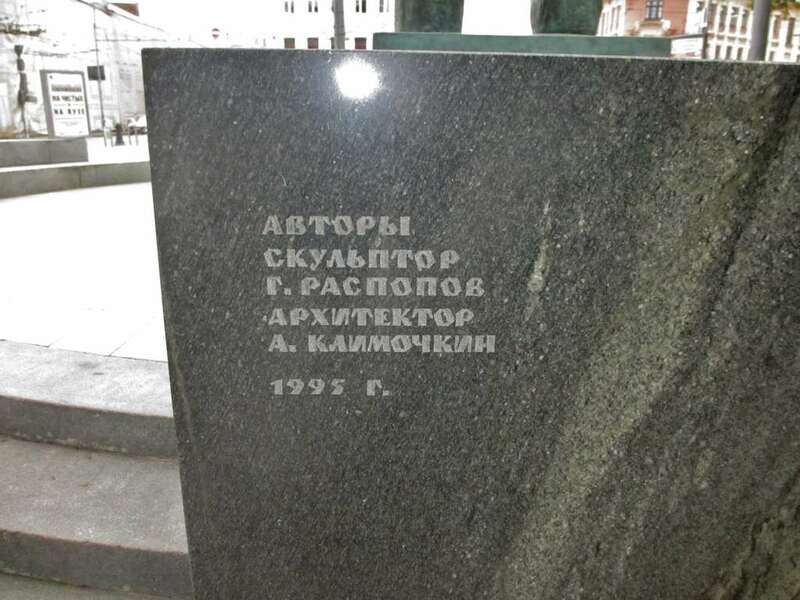 Another connection is the fact that a samizdat collection of Vysotsky’s poems/lyrics circulated in August 1980 before an official publication of his work was ever printed. We can also add that a group at the Voronezh State Pedagogical University has hosted an annual “Vysotskiana” conference ever since 1988. Oh, yes, and there is a tiny street, hardly more than a couple of blocks, that is named after Vysotsky on the east side of town across the Voronezh Reservoir. The upshot, of course, is that the connections are thin, indeed. Although, what does that mean? 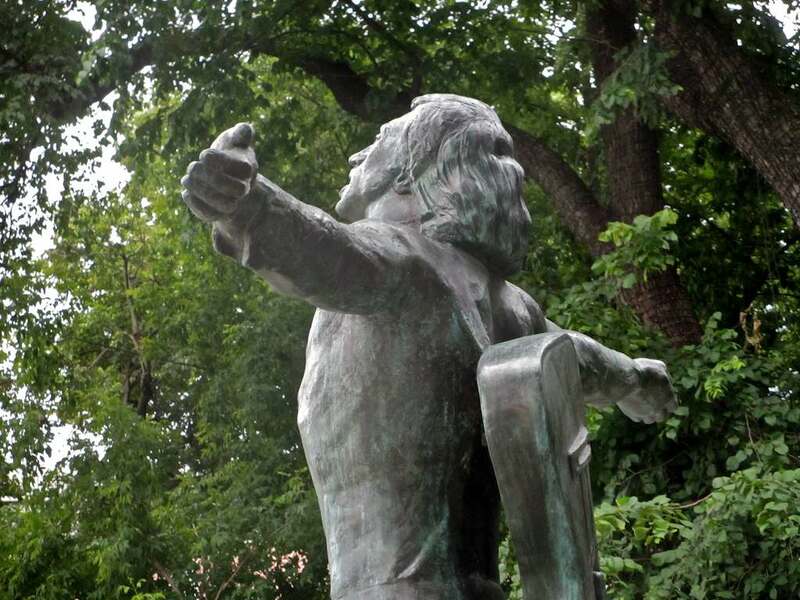 I saw a very cool statue of Shakespeare in Budapest, and what the hell, other than influence, connects the Bard to Budapest? Of course, that’s the point: Vysotsky’s influence on his and all later generations, all over Russia and the Soviet Union, was huge. 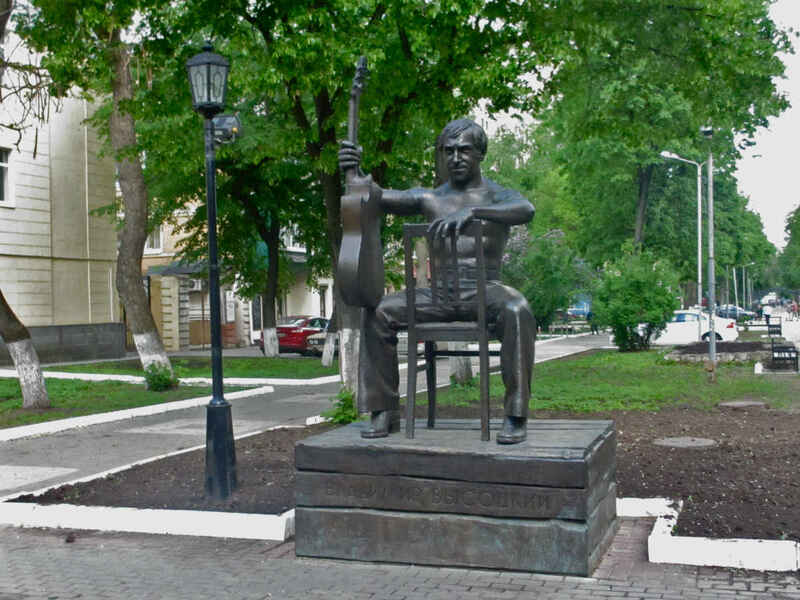 Ergo: there is every reason for the folks in Voronezh to want to honor him. As to whether this particular monument is fully successful in doing that, let’s leave that question open for the time being. 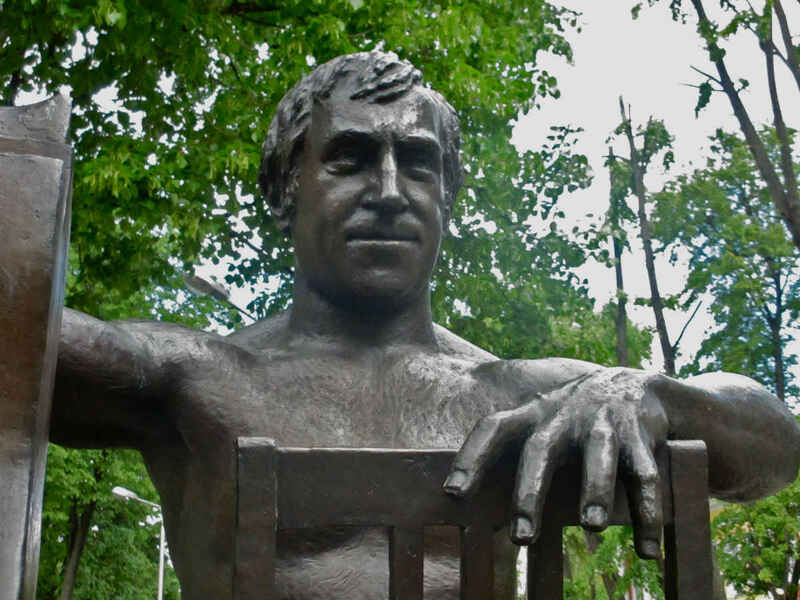 Are we still too close to Vladimir Vysotsky (1938-1980) to see him properly? It’s been a hell of a long time since we lost him – he died during the boycotted Moscow Summer Olympics. I well remember hearing the news. 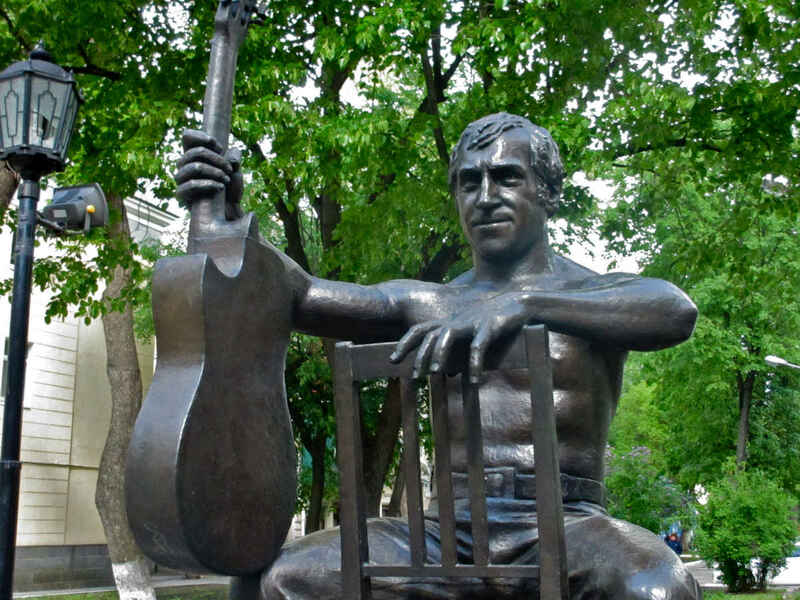 I had returned from a six-month residence in Russia seven months earlier and Vysotsky’s music and his presence were still very alive in my mind. I owned two French-made LPs of his songs recorded in France and I absolutely loved them. Still do, in fact. The quality of the recordings was so much better than the primitive arrangements and mixes you got on the few available Soviet 45s and LPs. More to the point, however, my friend Vladimir Ferkelman in Leningrad owned many of the famous reel-to-reel samizdat tapes of Vysotsky singing his songs at parties, at home and at concerts, so I had had the opportunity to experience the singer-songwriter (if I may use that term) the way he was most often experienced in Russia – in somebody’s warm, cramped, inviting, booklined home on an old, soft sofa, with several people hunched over a tape player to hear the man sing. People on both sides of the pond have, from time to time, tried to describe Vysotsky as the Russian Bob Dylan. That’s always irked me. It just doesn’t fit. Bob Dylan is Bob Dylan and you can’t define anyone else using him as a measuring stick. Any more than you can force Vysotsky into a framework built on another artist. But that’s just a little aside. As I say, all of this was still very vivid in my memory when summer 1980 arrived. By then I was living in Washington, D.C., and I was working at a bookstore in Georgetown. I’d make my way to a metro stop at the Pentagon from my apartment in Alexandria, and from there I’d zip into Georgetown to work. One morning I was standing on the platform waiting for the next metro train to approach and I was doing what everyone was doing – I was reading a newspaper that I held out before me. I hesitate to say which newspaper because one might expect it to be the Washington Post, although I’m pretty sure it was the New York Times. Anyway, there was a piece on the front page below the fold telling that Vladimir Vysotsky had died. Boom. That didn’t make any sense, I’ll tell you. The guy was 42. I knew Vysotsky as a singer and a writer of his own songs, and that’s what most everyone knew and loved him for. What was less obvious to some – especially a young foreigner wet behind the ears – was that he was also one of the great, charismatic actors of his time. 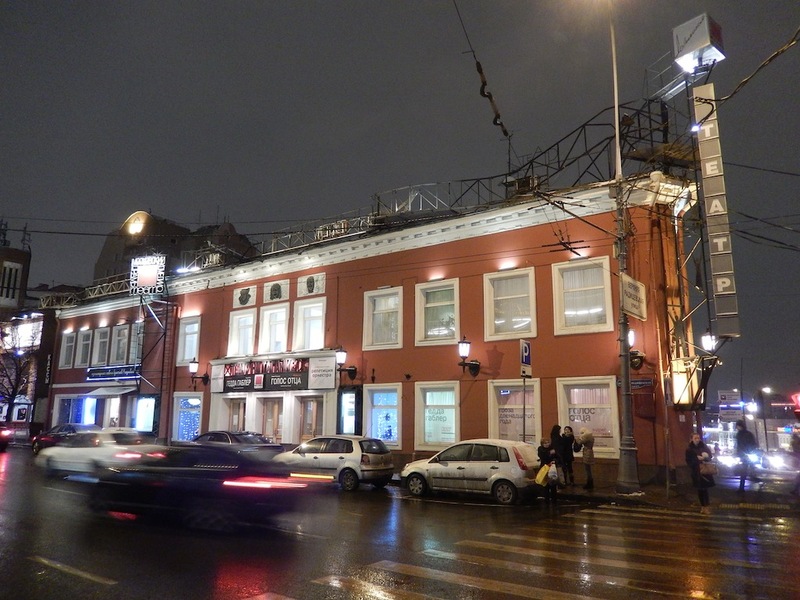 Vysotsky’s Hamlet at Yury Lyubimov’s Taganka Theater is one of the great legends of the Russian stage. 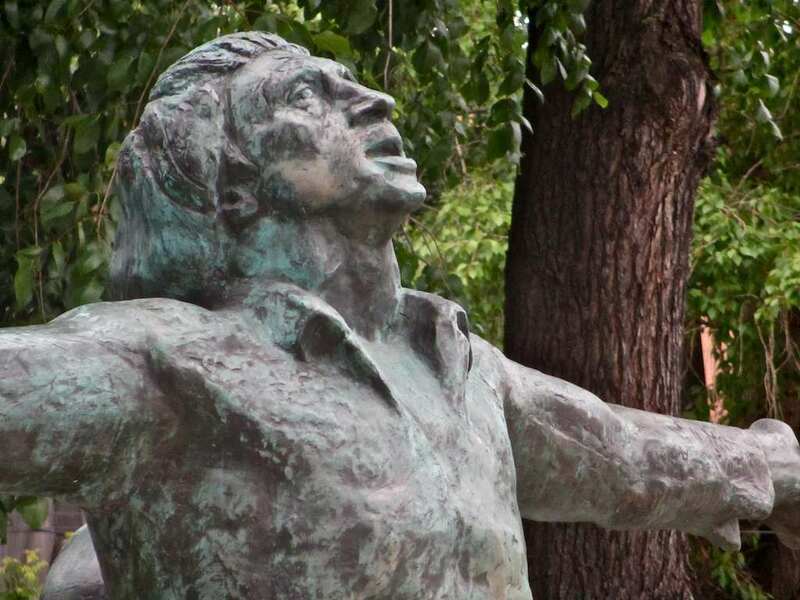 It is no secret that when Vysotsky died, Lyubimov lost just a little of his mojo at the Taganka and, before too long – four years later – he found himself in exile in the West. Vysotsky, like everyone else at the Taganka, drank like a fish. The difference was his genius. Lyubimov would fire or discipline other actors for showing up to work drunk, but he let Vysotsky get away with anything. It was almost a love affair. 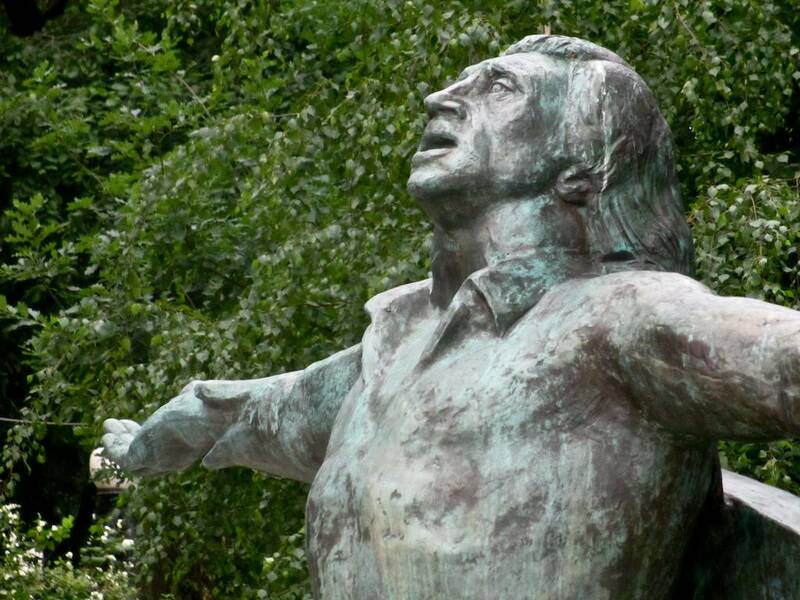 In fact I think Lyubimov’s worship of Vysotsky’s talent and charisma was very reminiscent of romantic love. It certainly sounds that way based on the memoirs and documents that have emerged in recent times. But to get back to my original comment about our still being too close to Vysotsky to get a real grip on him. 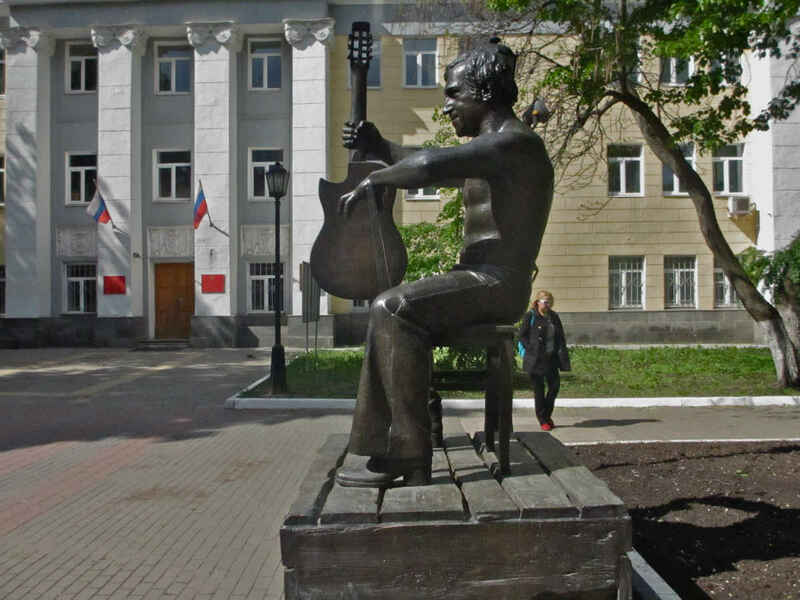 I began with that because the sculpture of the singer/actor that stands at the Petrovskiye Vorota plaza in Moscow just doesn’t capture the man for me. I see it as a kind of pop version, one that corresponds to the myth that lives and grows in the public’s mind, but which doesn’t get past the surface of the artist. I guess that’s okay, too. But I tend to respond better to art that is more daring and adventurous. This likeness by sculptor Gennady Raspopov and architect Anatoly Klimochkin seems to picture the performer soaking in the love of the masses. At the same time, his gaze is directed upwards; each of us can decide for ourselves what may or may not have attracted his attention up there. The statue was erected in 1995 and, if I’m not mistaken, it was the first monument raised to the great man, just 15 years after his death (caused by alcohol poisoning). I usually walk by the sculpture with a bit of a shudder and a thought or two of regret that I’d like to get closer to whatever made this man tick, but it’s not going to happen because of this piece of street art. What a seat of events the Taganka Theater has been over the decades! 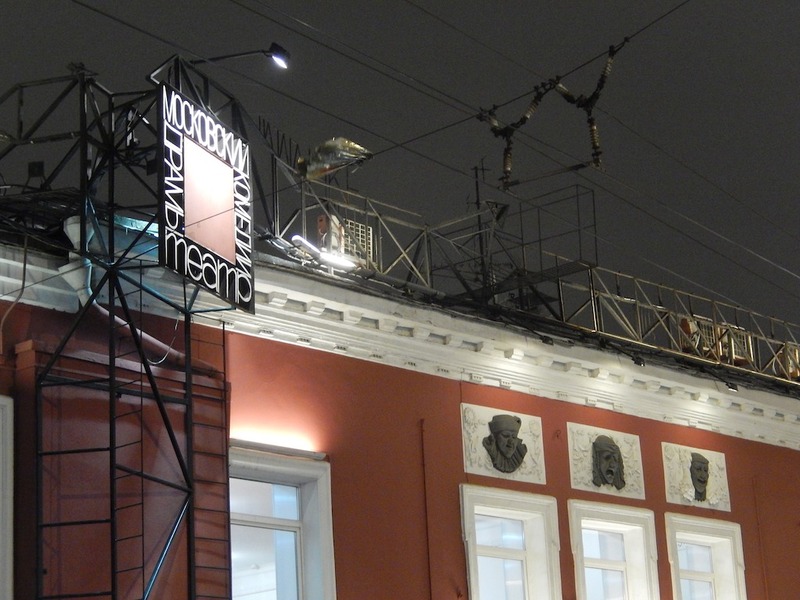 From Yury Lyubimov’s founding of the theater in 1964 (by firing almost the entire company that was there before him); the staging of some of the greatest productions in the history of Soviet Theater (The Good Person of Szechuan (1964), Hamlet (1971) and The Master and Margarita (1975); the exile of Lyubimov in 1984; the hiring and death of Anatoly Efros in the mid 1980s; the triumphant return of Lyubimov in 1989; the rancorous split that cut the theater in two by 1991; the scandalous break between Lyubimov and his troupe in 2011 which ended with Lyubimov resigning at the age of 93 and going solo; the bitter 50th anniversary season in 2013-2014 when a small group of disgruntled actors sought to sabotage official celebratory events throughout the season. And those are just SOME of the highlights… These images, taken in late fall 2013 on a snowy/drizzly day, seem to suggest that this theater will continue to live a vibrant life no matter what battles are going on inside it. In fact, it seems the more strife there is here, the more life there is.